“My Dark Side” by my friend, J. Ramirez, was released on September 22nd and has been going strong ever since!! 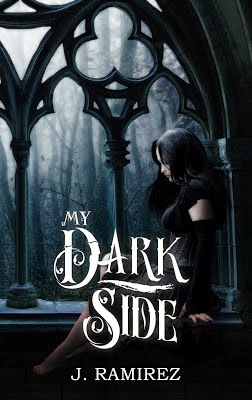 It is a fantastic novel, one that I truly enjoyed from beginning to end...I wanted to let everyone know what sites you can find “My Dark Side” on so that no one misses out on this great read!!! When I was younger, Halloween held a very simple meaning to me: lots of candy and fun costumes! I remember looking forward to it when I was in elementary school because we could take our costumes to school, and near the end of the day, change into them for a Halloween party. There would be candy, cupcakes, games, and (most importantly) a parade - in which we all got to participate, and walk around the school showing off our costumes to all. There was nothing like it! As I got older, the fun of dressing up remained but the parties themselves have changed. Now there are costume competitions, local clubs or houses, and fancy drinks that with the help of dry ice, fog over while you drink it. This holiday has always been a favorite of mine, and though I did not find out until later the fantastic history and meaning behind it, Halloween has always held a special place for me. After much research, I found that there is a lot behind what made Halloween what it is today. So though I would love to go into detail about every interesting aspect of it (and it is fascinating), I will hit on parts that (for all intentions) I found to be highly interesting. Of course, since I plan on writing a little every day this month of topics directly or indirectly concerning Halloween, I’m sure I’ll fit in information that I may not have hit on here...So, without further adieu...Here’s what I found! Halloween originated from the Celtic holiday, Samhain, which is Gaelic for “summer’s end”. This was a day that the Celts believed the line between the living and the dead would become blurred. The dead would be able to come across at this time and either find their loved ones, or take revenge against those they feel did them wrong. They also felt that on this day fairies would also be able to come into our world to cause mischief or harm. It was these beliefs that brought on the tradition of wearing costumes on Halloween. People would dress up in different costumes or wear various masks to hide themselves from the evil spirits. They would also dance around bonfires to keep evil spirits away, but at the same time they would leave their doors open in hope that the kind spirits of loved ones might join them around their hearths. This was a very important time of year for the Celts, for this day not only marked the end of summer and the harvest, but also the beginning of the dark, cold winter - a time that was often associated with human death. By the end of the 12th century, October 31st (Halloween/All Hallows Eve), November 1st (All Hallows Day) and November 2nd (All Souls Day), had become holy days of obligation across Europe. They involved such traditions as ringing bells for the souls in purgatory. "Souling", and the sharing of soul cakes, which after being eaten, was supposed to represent a soul being freed from purgatory - this has been suggested as the origin of trick-or-treating. Groups of poor people, often children, would go door-to-door on All Saints/All Souls collecting soul cakes, originally as a means of praying for souls in purgatory. This was very much like the young in Scotland and Ireland, which would go around for money or food. Similar practices for the souls of the dead were found as far south as Italy. Shakespeare mentions the practice in his comedy The Two Gentlemen of Verona (1593), when Speed accuses his master of "puling [whimpering or whining] like a beggar at Hallowmas." So as you can see, this holiday was widely practiced throughout most of Europe, with some of the earliest documentations coming from well over 2,000 years ago. Around 1605 however, Britain saw these customs come under attack during the Reformation, and the English saw the popularity of Halloween wane while the popularity of a very cosmetically similar holiday, Guy Fawkes Day (November 5th), rose. In Ireland and Scotland however, the tradition of Halloween (Samhain) remained strong and thrived. Surprising to most, it wasn’t until the 19th century, during the mass Irish and Scottish immigration, that the first documents of Halloween were noted here in the states. It was celebrated mainly within the Irish and Scottish communities and, gradually, spread into the mainstream society. It was within the early years of the 20th century that this beloved holiday was documented as being celebrated from coast to coast - by everyone, regardless of religion or race.